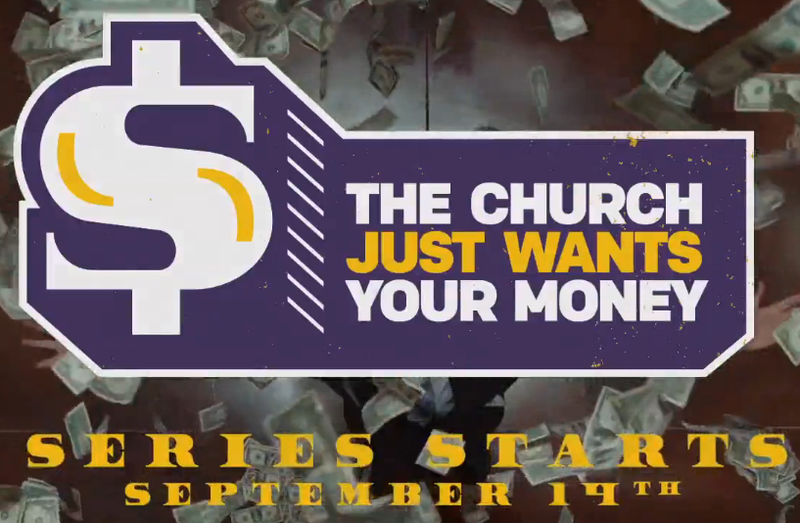 Perry Noble and NewSpring Kick-Off the Tithing Season with Parody of Themselves!! On one hand this is some masterful marketing. Not a bad idea to deflect criticism about Perry Noble's nutty tithing teachings by making a parody video and a series based on the church just wanting your money. Truth is the problem with Perry is not that they "just want your money"...it is the ridiculous teachings that Perry uses to convince Christians that if they want God's blessings - in fact if they want to avoid a CURSE from God himself - they must give 10% of their money to Perry's church. And really, that is NOT funny. So NewSpring church members - there really is nothing humorous about what Perry is going to teach you. It is not something to make light of. If you actually believe what Perry will teach you about tithing and you follow his teaching on "redeeming" your income, that 10% of your income is required, etc. etc., it can do much harm to you and your family. "Technically, Judas betrayed Jesus over tithe money." "When it comes to your finances, they are either blessed by God, or cursed by God, there is no middle ground..."
Perry will stop at nothing to convince his church members that they MUST give 10% of their gross income to his church or they will be cursed by God. Bottom line: Perry really is his own parody. To study Perry's teaching on money is itself a lampoon of church finances. Go here, here, here, here, here, here, here, here, here and here and you'll see what I mean. Or just type in "Perry Noble" in the Watchdog search, and you'll see even more. So the Watchdog is at the ready to examine Perry's parody series of his own silliness when it comes to finances. Well, Prestonwood Baptist and Pastor Jack Graham have joined the first-fruits, tithe-redeeming crowd in the SBC that says Christians must give the first 10% of their income in order to "redeem" the remaining 90% - thereby magically making it more valuable than the entire 100%...and if you need more money, God will magically get other people to give you money. But it wasn't Jack himself who delivered the message to the Prestonwood faithful, it was a guy named "J. John", a British evangelist who became popular a few years back with his "Just 10" sermon series on the Ten Commandments. To convince Prestonwood members they need to tithe, "J. John" uses a "doughnut" analogy to tell everyone at Prestonwood that they all get "10 doughnuts" each week, and that "God owns all the doughnuts" and the value of each doughnut varies from person to person. "God says: 'If you're a follower of Jesus, you take one of the doughnuts and you take it to your church where you belong to, and you offer it to the church, as an act of worship." At least J. John doesn't misuse scripture in his tithing lies - he just references no bible verses at all. J. John just apparently knows the mind of God and tells everyone what "God says". And since "God owns all the doughnuts", J. John says that Christians should "stop complaining" that they have to give one of them back to the church. J. John goes further, and tries the old "the tithe redeems the other 90% of your income" trick. He says that your doughnuts are "secular" when you earn them, but by giving one of the doughnuts they all magically become "sacred". "Those doughnuts are secular. When you take the secular doughnut and you give it the church you belong to...that doughnut becomes sacred. When that doughnut becomes sacred, the other nine doughnuts become sacred. Nine sacred doughnuts are worth more than ten secular ones." Secular and sacred doughnuts. Is it any wonder people are leaving churches? If these guys tell fantastic stories and fables about magical money - why would anyone believe ANYTHING ELSE they are saying about ANYTHING? "When we've got nine doughnuts, if we do need more doughnuts, and God knows we need them, he'll make other people give us a few doughnuts. It's amazing how it works..."
Yeah, right. It's amazing how it works, all right. How it works is this: J. John is a hired gun to convince people to give money to the church or ministry that hires him. In this case, it was Jack Graham who hired J. John. A few years ago, it was Joyce Meyer who hired J. John. "There are thousands of us here who don't even need nine [doughnuts]. So what does God say? Right. 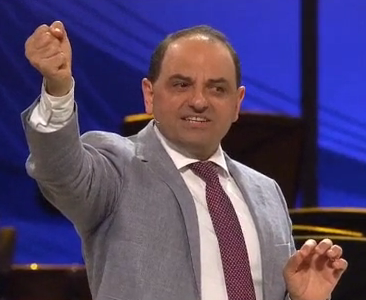 'I want you to give a doughnut to Joyce Meyer so she can go on TV every day. So you give one of your doughnut sand you become a monthly supporter.'" There you have it. J. John is hired by Joyce Meyer to tell the women at her conference that God says to give one of their doughnuts to Joyce Meyer so she can be on TV. Prestonwood members, do you feel like suckers now that you know J. John uses his tithing fable to raise money for Joyce Meyer, then comes to your church with the same fable?